Conscious Camp- May and September camps – Held workshops, One in collaboration with The Rainbow tent and No frills Wellbeing– I volunteered and helped to co-ordinate The rainbow tent and collaborated in a Ceremony of the Ancestors in which I embodied and played the roll of Gaia. I ran a workshop- ‘Butterfly woman’ in which i held space in sacred circle for story telling. I also ran a workshop a day- ‘Flow River Flow’ where i lead a group down the River Dee- Holding hands, Holding bodies, Singing. House, Studio Residency with The Museum Of Lancashire, MOL– a group of artists will work in the studio from November-March And will host 3 open studios and a final exhibtion in the museum. ‘Universal Wave’ Mill street, Wheelton- connecting the street, connecting the community, absorbing the current that pulses. September, 2015- One day exhibtion/happening. Printmaking Solo show, ‘Venus‘, Blackburn Is Open shop, Blackburn. A series of dry point etchings exploring Venus in nature and rooted in earth and the cosmos. Commission for Myerscough College- student dorm room mural- co designed and curated with Sophie Skeller and Holly Knowles. 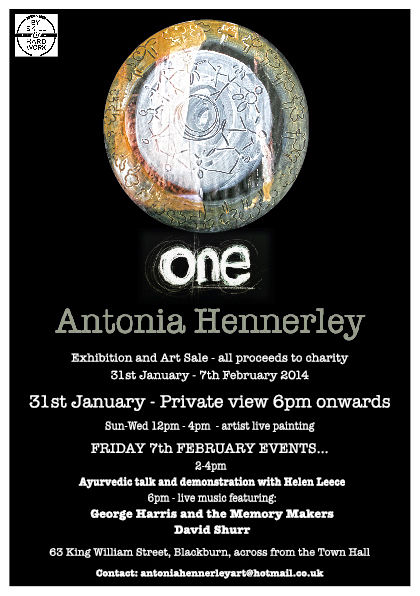 Solo exhibtion, January, Empty shop in Blackburn town centre, ‘ONE’, all proceeds to Friends Of the Earth- a 2 week long exhibtion with happenings/events- consisted of 2 music nights, a Indian sharing free food night, an Ayurvedic talk, and each day 3 days a week- live painting and open art classes for the public. Joint exhibtion with Emma Raey, in an empty shop in Blackburn town centre- December as part of Blackburn is open Christmas event with Wayne Hemmingway.